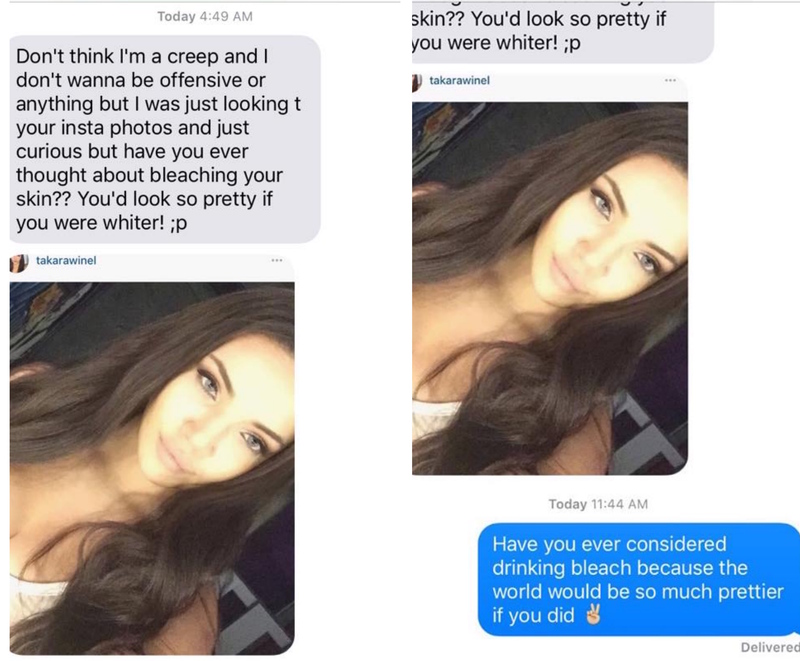 Takara Allen, 22, shared a post on Facebook this week which revealed a message she received from her Tinder date recommending that she bleached her skin. The skin-lightening industry is worth over £14 billion worldwide, and often preys on women’s insecurities regarding their skin tone. Colourism – discrimination against individuals with a dark skin tone, including by people from the same ethnic group – developed during colonialism, and means that in many cultures lighter-skinned women are regarded as being more attractive and desirable than darker women. “It literally came out of nowhere to be honest,” Allen told gal-dem, “I wasn’t expecting the text at all, and the only thing that had been mentioned prior to that about my race was him telling me I was pretty for a black girl when I’d met him in person for a date. Having first moved over to Australia in 2003 when she was eight, Allen finally settled in Adelaide in 2011. Allen said dating in Adelaide was often difficult because there was “so much fetishisation”. “I always get the ‘so pretty for a black girl’, ‘I’ve never been with a black girl before’, ‘I love black women’ comments. I haven’t had great experiences on Tinder as most guys on there are only after one thing, but there’s definitely been nothing like this before,” she said. To find out more about the dangers of skin-lightening and colourism, check out gal-dem’s skin-lightening series. Are you a woke pixie dream girl?